We’re proud to announce that all Awesome Playgrounds stores now accept the Australian Baby Card! The Australian Baby Card is a discount card specifically for parents with young children or soon-to-be parents. ABC has teamed up with heaps of fantastic companies across Australia to bring cardholders super discounts and special offers. Since its’ introduction, heaps of parents have applied for the card and are now enjoying the exclusive savings offered to cardholders! Visit the ABC website (by clicking the image above) to view our unique offer for ABC cardholders only, plus many more discounts for young families. To apply for your Australian Baby Card today, simply click here! 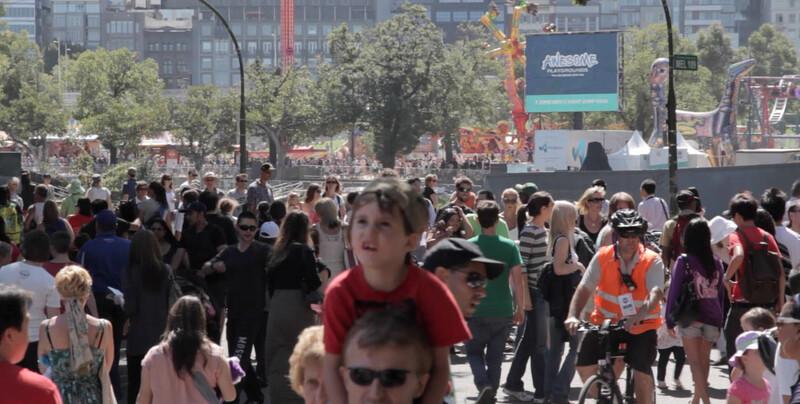 Awesome Playgrounds ran our first ever TV ad at the Moomba Festival over the Victorian Labour Day long weekend. Early estimations have indicated a record-breaking turnout at this year’s event with pedestrian traffic reaching just over 1,000,000 people over the 4 day event. There was great weather the whole weekend and an almost overwhelming amount of activities to do and spectacles to see! We were really pleased to have our ad being shown constantly throughout the event and we were also quite proud of how our ad turned out (check it out on our Facebook page)! 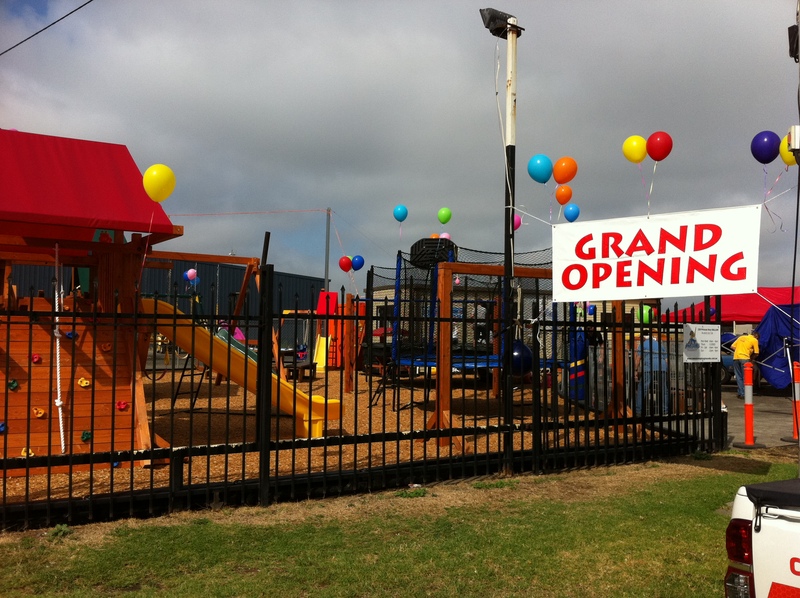 Having spent the day at Awesome Playgrounds Hallam I can tell you that their Grand Opening was properly awesome! 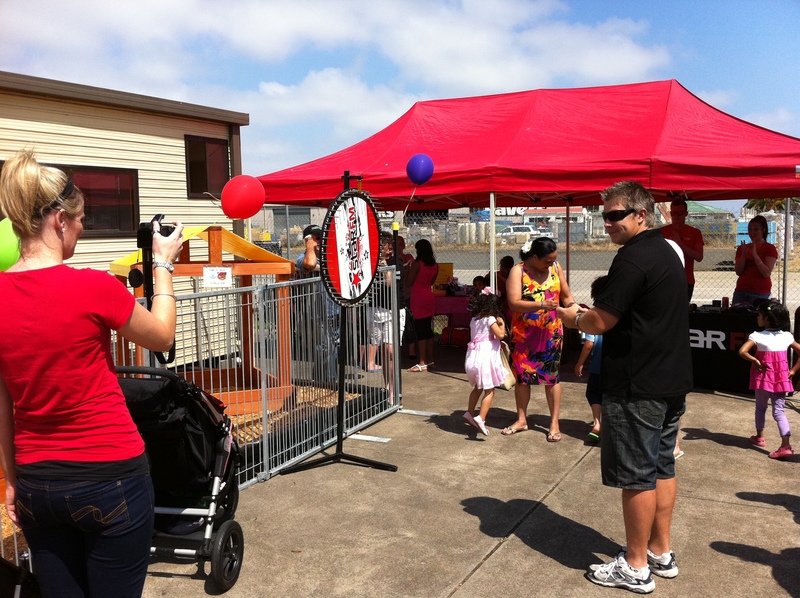 It was a day full of sun, music, sausage sandwiches, great products and savings plus heaps of fantastic customers! Star FM did an amazing job with their live broadcast and were very entertaining the whole time. We also learnt that the Hampton Park Lions Club cooks a mean sausage sizzle, so a big thank you to those guys too! Rick and Tanya, AP Hallam’s owners, were incredible in achieving a hugely successful Grand Opening. They went all out in preparation and you could definitely tell their hard work payed off. AP Hallam the morning of the Grand Opening! 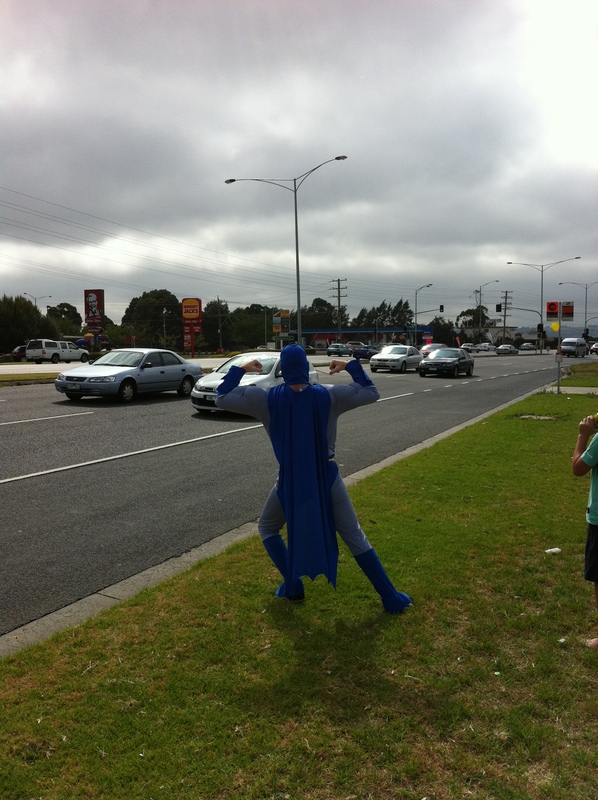 Batman impressing the passing traffic with his biceps! The Star FM Prize Wheel was a hit! Each customer who purchased on the day got the chance to win some great prizes! Thank you to everyone who stopped by, I’m sure you all had an Awesome time! Check out our Facebook page for all the photos from the Grand Opening! 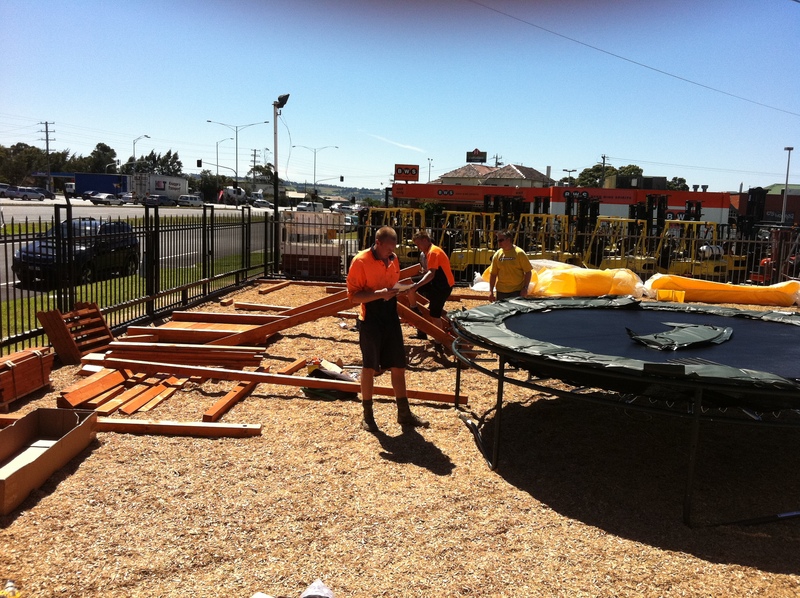 Setting up an Awesome Playgrounds yard is far from easy work. This was no different for Rick and Tanya, and even though they had a multitude of other tasks to take care of apart from setting up the yard (as well as taking care of their young one), they worked hard and it’s fair to say, achieved an amazing result! 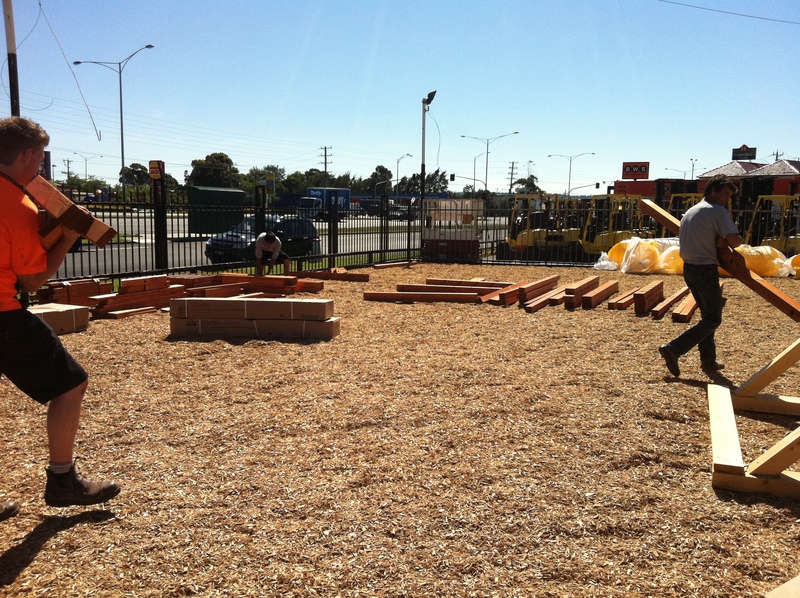 To give you a brief idea of how the yard at Awesome Playgrounds Hallam was set up, here’s a quick photo log! 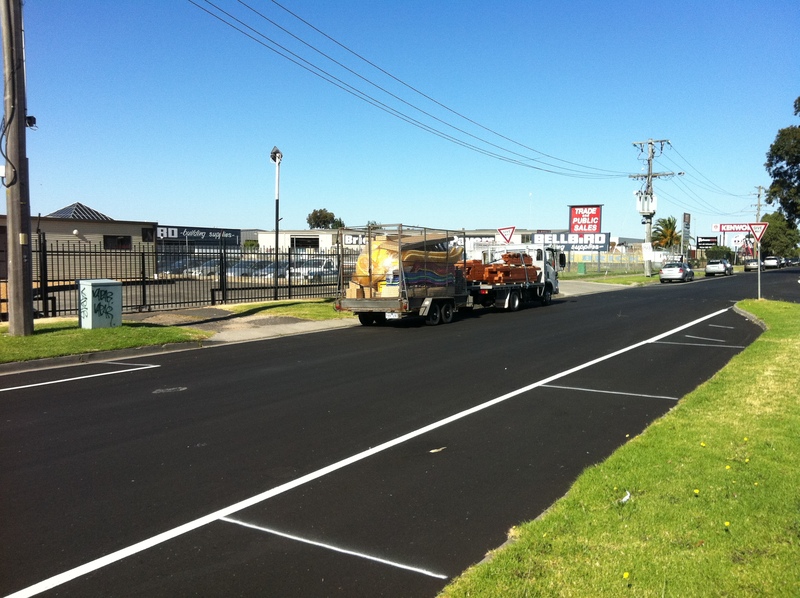 The first day began with the Awesome truck, fully loaded, arriving at the Hallam yard. The softfall was laid and ready for the team to start installing the Awesome products! So the boys started unloading everything. Building then started and the yard looked more like a construction site for the next couple of days! With a good sized team the yard came along quite quickly. The huge Big Foot Gym Package 5 was a big job on its’ own! 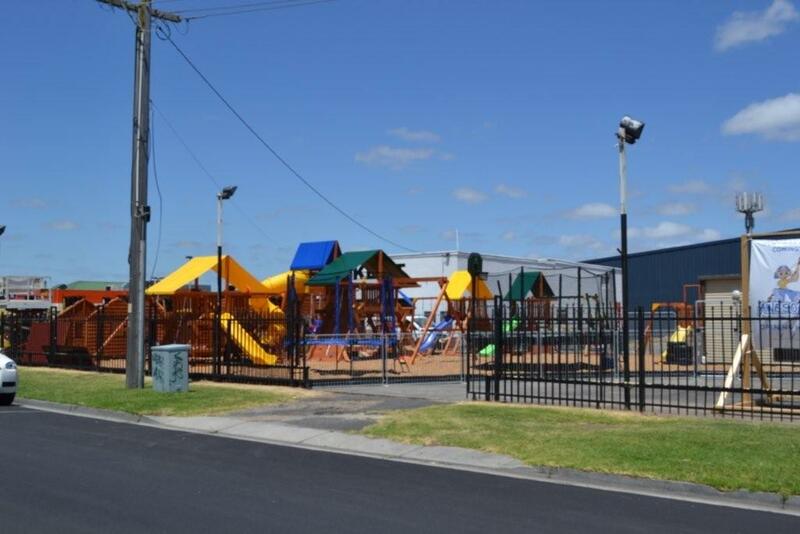 Then in no time, the Awesome Playgrounds Hallam yard was almost there (even though the cubby houses were still looking a bit bald)! And it sure looked good from the street too! 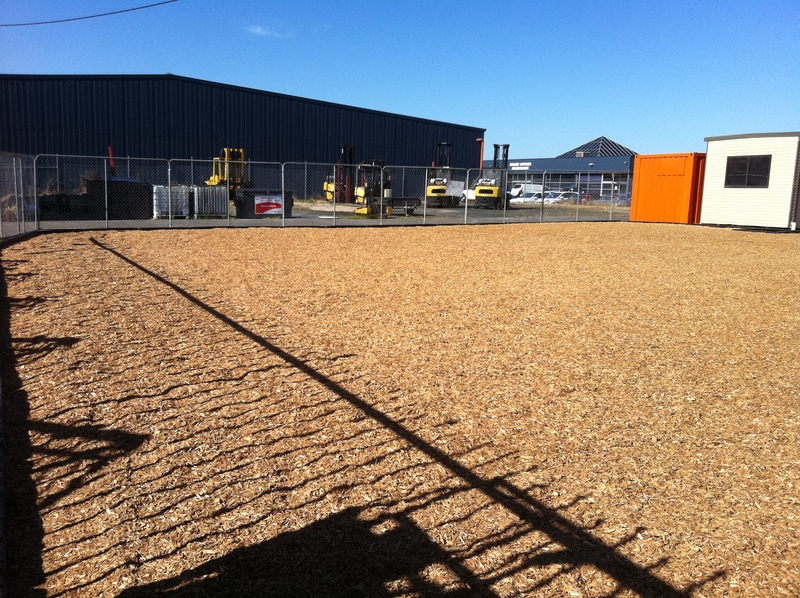 Finally, the team reached the end goal; an attractive, completed yard that looks AWESOME! 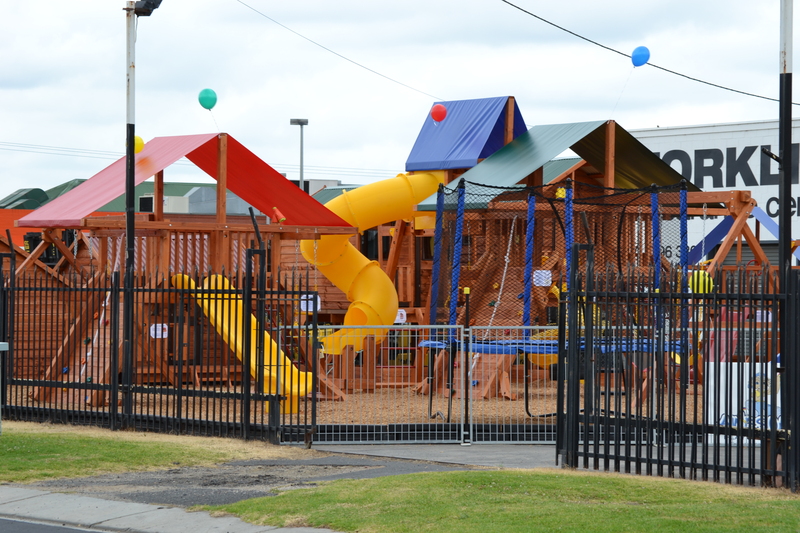 So there you go, that’s the story of how the yard at Awesome Playgrounds Hallam was set up! It was a good 3 days work but it was well worth every minute spent. 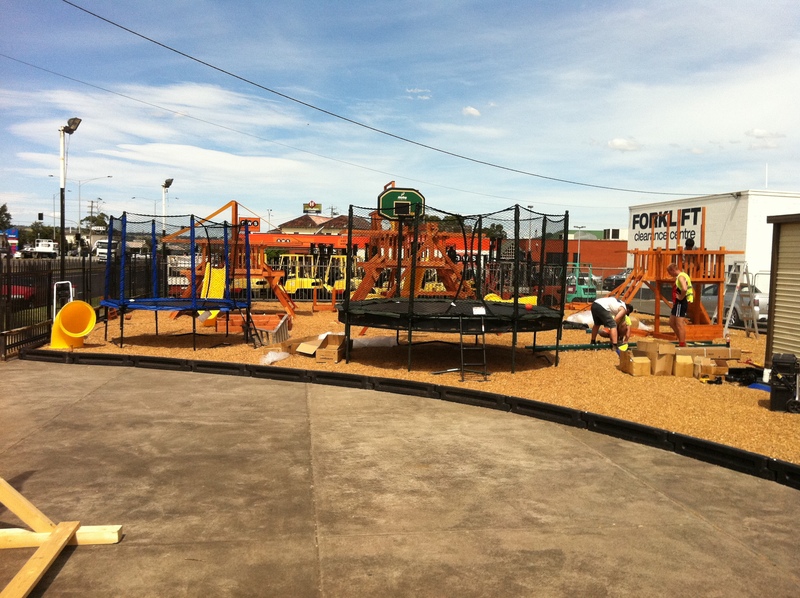 Rick, Tanya and the Awesome Playgrounds installation team, well done! 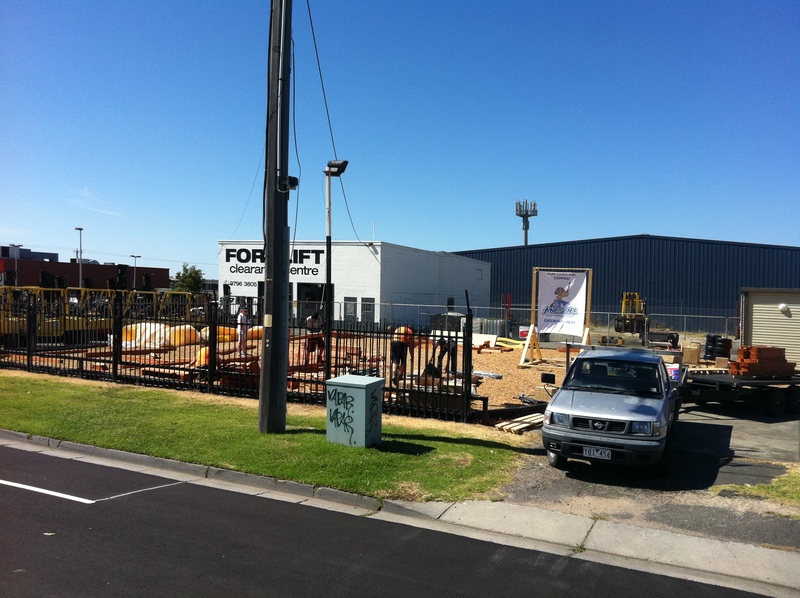 As of this weekend, we are very excited to announce the opening of Awesome Playgrounds in Bendigo! What was Bendigo Scratch and Dent has now become Living Quarters, a home living store that sells everything you need inside and outside around the house. 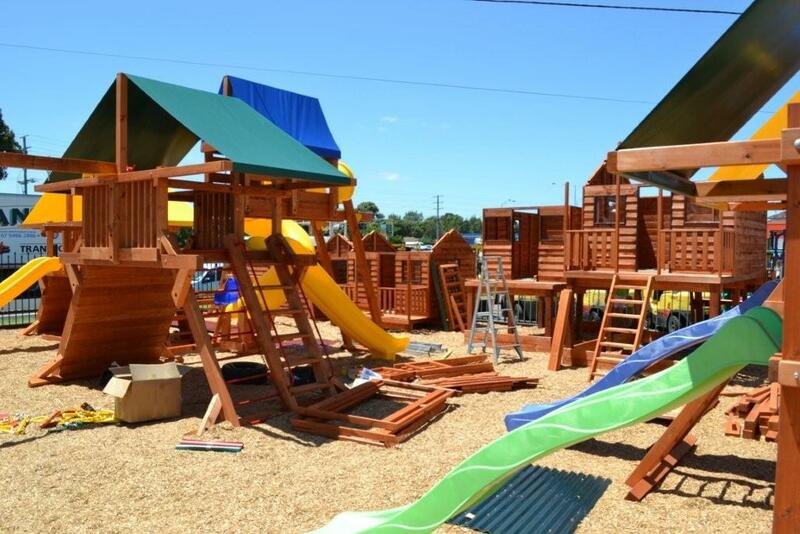 Whilst Awesome Playgrounds represents only a part of the outdoor living department, they will still offer the complete Awesome range from cubbies to trampolines and everything inbetween. The Grand Opening is to be held on Saturday the 23rd of July 2011, and it will be an incredible day for young and old. Typical of an Awesome Playgrounds Grand Opening, there will be entertainment and activities such as face painting, a sausage sizzle, the local radio station broadcasting live from the store, in addition to the ridiculously good specials and savings to be had on the entire range of Living Quarters products. 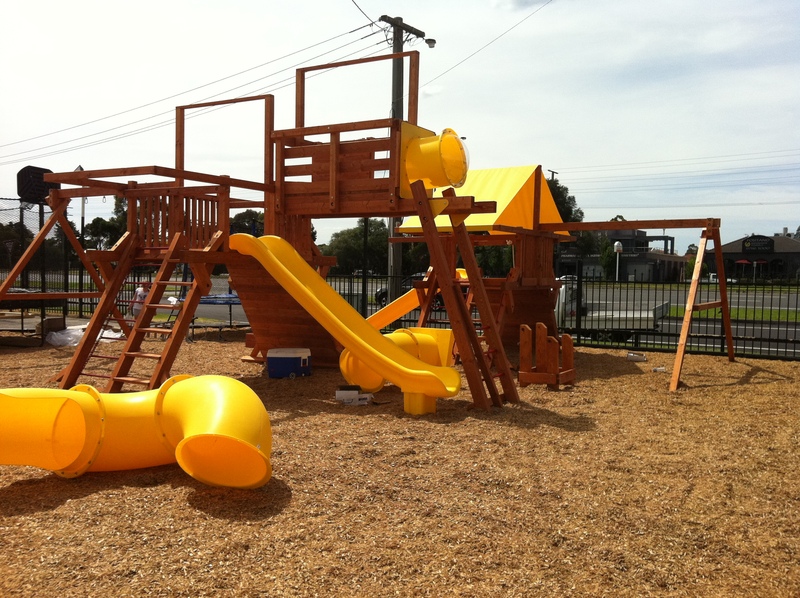 Lisa and Craig run the show at Awesome Playgrounds Bendigo, so stop by the store for a chat and check out all the Awesome products they have!